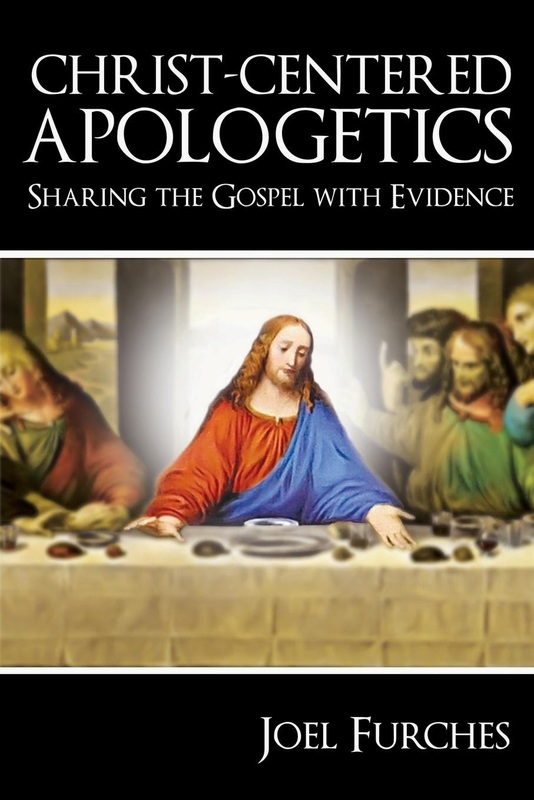 Joel Furches, author of Christ-Centered Apologetics: Sharing the Gospel with Evidence, took time out to answer a few of our questions about apologetics and his new book. Q: Can you tell us how you got involved in apologetics and how long you have been doing it? I grew up in a pretty sheltered Christian environment. I went to a Christian School, to church, and vacationed at Christian resorts. All my friends and all of the friends of our family were Christians. Of course, when I went to college, my parents helped me pick a Christian College. So in my first Bible class in my freshman year, when my professor opened the Bible and began to talk about how the Old Testament was a compilation of Babylonian and Egyptian myths edited, and re-written over generations by a number of Hebrew scholars hundreds of years after the fact, all of which had different agendas, I was completely unprepared for this. I couldn't understand how my college professors called themselves Christian, and yet did not actually believe the Bible. During my four years at college, I encountered a flood of denominational differences and a variety of different scientific and scholarly views on the Bible which made me realize that I was woefully ignorant regarding the knowledge that undergirds Christian beliefs. While these experiences did not cause me to “lose faith,” they did leave me hungry for any kind of teaching that could tell me more about whether science, philosophy, and history gave any support to the things I had been taught my entire life. Sadly, I didn't know about Apologetic material, and it didn't seem to be available as I was looking. Consequently, I languished in a kind of spiritual wasteland for a number of years. I wanted material that would teach me these things, but I could find little or nothing in the way of resources. This all changed in a pretty unexpected way: when I got my first smartphone. The phone came with a podcast application which gave me access to a broad catalogue of podcasts that actually discussed the scholarship and science behind Christianity. I subscribed to as many of these channels as I could, and spent all of my drive-time and down time listening to these. I began to purchase the books that they recommended and read through these. In 2011, I found a freelance writing job for The Examiner. I originally subscribed to write a column on music, however that position wasn’t open. In searching for open positions, I was surprised to find that they wanted a local column on Christian Apologetics. I didn't go looking for this writing position; it found me. I was actually uniquely qualified to write on Christian Apologetics. My childhood, while not very informative in the Apologetics of Christianity, did give me a tremendous knowledge of scripture. My college experience had given me a solid education in liberal theology and Higher Criticism, and my personal study had given me a comprehensive knowledge of arguments coming from an atheistic worldview. I have a strong background in psychology and sociology – as these were my primary areas of study in school. This is how I began writing in the field of Apologetics. My work with The Examiner served as a gateway into other apologetics and scholarly writing. For about two years, I wrote for Bible Translation Magazine during which time I contributed material about Biblical Criticism to a book published by the same company. I have also written guest columns for several other publications, been interviewed on a radio show about Apologetics, and I’ve even had one of my articles featured by an atheist radio show which attempted to disprove my argument. Q: You just released your first book. Tell us about that experience. This project didn’t originally begin as a book. I had approached my church about teaching an adult class in Apologetics, and they had agreed. In looking through pre-existing curricula, I was not really satisfied by anything out there, and decided to write my own. In outlining, researching, and writing up the class, I prepared the framework for the book. With the amount of material I had, I knew I could easily use the course as material for a book, and so I ran the idea past my editor at Bible Translation Magazine. He told me he would definitely publish it once I was done, so I began shaping it into a book. The writing was relatively easy. I am an experienced writer, and I had all the raw material I needed to make the book a reality. The hardest part was going back through my research and referencing all of my sources. Once I had a book, I submitted it to my editor at BTM. After some minor disagreements over things like the title and format, my editor told me that he would not publish my book. This was upsetting because I would not have put so much time and work into the project if I didn’t know for certain it was going to be published. I began shopping it around to other publishers, and was picked up by CrossLink. Ultimately, this is the best thing that could have happened. BTM is a small-time operation which is essentially self-publishing. CrossLink is a major Christian publisher. This reflects the quality of the material and writing in the book. Q: In your book you offer a defense of the Gospels. What are some of the reasons that have led you to the conviction that they are reliable? In all honesty, the thing that impresses me most about the Gospels is the wisdom and authority with which Jesus speaks. It is astounding every time I read it. That a man from the first century could argue with the genius that Jesus possessed, and that his ministry could speak to people at all levels of education and intelligence across all cultures is the testimony which convinces me of their truth. I don’t think that this is necessarily a bad apologetic argument, either. One would expect a book inspired by God to speak to the broadest possible audience, as the Bible seems to do. In fact, it is historically true that the Bible has been the most influential book in all of history – so much so, that all Western religious texts – from the Qu'ran to the Book of Mormon, even the Satanic Bible – live on its borrowed capital. That this is backed by the hefty scholarship that I outline in my book makes it all the more persuasive. Q: There are numerous apologetics books on the market. What makes your book unique? Apologetics is a fascinating and diverse field which covers a staggering range of topics and fields of thought. Christians who become heavily involved in Apologetics have no end of resources and interests that they can explore. But Apologetics is not just a tool to appeal to the intellectual Christian: it is primarily a field intended to make the case for the truth of Christianity to a skeptical world. And the ultimate reason for a Christian to participate in conversations with non-Christians is to introduce them to Christ – in other words, Evangelism. I would challenge anyone who is “into Apologetics” to think of the last time they had a conversation with a skeptic. How did that go? What did that look like? Did the discussion focus on the Gospel of Christ? Did the discussion even mention Christ? On the same token, I would ask any person who does not know much about Apologetics to recall the last time they talked about their faith with a non-believer. Did they encounter roadblocks or challenges that prevented them from sharing the Gospel? Evangelism and Apologetics should go hand-in-hand. Historically, they always have. When one looks at the Apostles and Evangelists in the New Testament, they share their Gospel with Apologetics. My book focuses Apologetics where it always should have been focused: On Christ. Moreover, my book instructs the Evangelist in how to use evidence and reason as the mechanism through which they can communicate the Gospel message. Q: What should readers expect to walkaway with after reading your book? The reader will walk away with an extremely thorough case for the reality of the Biblical Jesus; backed with arguments and evidence under their belt. Better still, my book discusses methods to speak to the cynical and skeptical culture in which we now live. It describes techniques and pitfalls that will allow them to communicate without combat, and to speak sympathetically instead of antagonistically. A person who studies my book will be thoroughly equipped to share their faith with the confidence that history and scholarship provide. To order Joel's new book, go here. To checkout Joel on The Examiner, see here.